The spectacular white coats of white tigers are caused by a single change in a known pigment gene, a new study has found. The research, to be published in the June issue of Current Biology, might help end decades of speculation that the trait is a genetic defect. Researchers from China's Peking University mapped the genomes of a family of 16 tigers living in Chimelong Safari Park in southern China, including both white and orange individuals. They then sequenced the whole genomes of each of the three parents in the family. 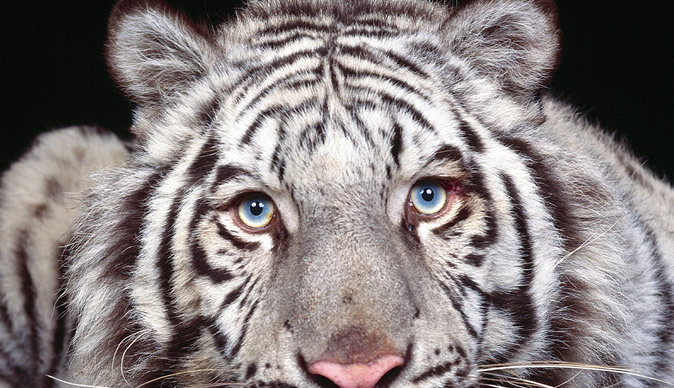 In the end, the researchers found the white tiger carries a variant of a pigment gene called SLC45A2, which had already been associated with light coloration in modern Europeans and in other animals, including horses, chickens, and fish. The variant of the gene primarily inhibits the synthesis of red and yellow pigments but has little to no effect on black, which explains why white tigers still show characteristic dark stripes, the researchers said. "The genetic study solved the mystery about what makes those tigers white," Luo Shujin, author of the study said in an email interview with Xinhua. "It shows the white tiger morph is a naturally occurring feature and should be considered a part of the genetic diversity of tigers that is worth conserving." White tigers were first discovered in the Indian jungle as a variant of Bengal tigers but have now disappeared from the wild, Luo said. Luo said that many white tigers in captivity are inbred in order to maintain the white coat trait and consequently suffer some health problems such as crossed eyes, leading to the controversial speculation that the white tiger mutation is perhaps a genetic defect.